Sri Lanka may be a small island nation but there is a lot to see and do. It is not uncommon to read about how much beauty and diversity is packed into Sri Lanka, because it is simply very true. Over the past few years, the South Asian country formerly known as Ceylon has become very popular for travelers following the end of a long-standing civil conflict. When it comes to describing the country's tourism wealth, it is hard to know where to start. The country, which at 65,610 square kilometers makes it slightly smaller than Ireland, boasts eight UNESCO World Heritage sites. One of these is the famous 400-year-old coastal fort in Galle city, while another is the towering Lion Rock at Sigiriya in the central plains. And then there is the Temple of the Tooth in Kandy, which holds one of the Buddha's teeth. The southwestern and eastern coasts have lovely beaches while hill country features mountains, lush forests and tea estates. With so much to see, it is impossible to take in everything in just two weeks, but I did get to experience some of the country's best historical, scenic and urban sights. The capital is Colombo, and most international visitors arrive at its airport. It is not a famous tourist destination, but neither should it be ignored, so we will return to it later. Galle Fort is a robust former garrison that abuts the Indian Ocean and still houses a thriving community. It is more like a small town than a fortress, and one can spend many hours walking the streets and exploring the museums, shops and buildings there. Or one can enjoy the sea view by following the stone walls and towers that curve into the sea and are still intact despite centuries of wear and tear. The fort is a testament to the ingenuity of its European builders and the island's tumultuous colonial past. First built by the Portuguese in the 15th century, who came and captured the area from local rulers, Galle Fort was improved and expanded by the Dutch who ousted the Portuguese and took control themselves. I visited the fort twice - the first time during the evening when I arrived in the city. As I watched the sun set gradually over the Indian Ocean amid the soundtrack of waves crashing onto the fort's walls, I was reminded of how pleasant it is to be by the seaside. The next day, I returned to the fort, where I walked through the streets and along the coastal wall, where I saw local youths swimming in the clear sea and colorful fish in the shallow waters. Among the more interesting buildings were the Historical Mansion, a renovated former house that is now an antiques museum and jewelry workshop, and the Meeran Mosque, a stately white mosque that has a boxy appearance. Not far from Galle are several bustling beach towns, including Hikkaduwa to the north and Mirissa in the south. In the former, surfing and snorkeling can be enjoyed. Sri Lanka is visited by five types of sea turtles including leatherback, loggerhead and hawksbill, and you can see them at a small sea turtle center in Hikkudawa. The center collects turtle eggs to allow them to hatch into little turtles and thus, avoid being cooked for food. The center has several turtles, swimming in separate outdoor tanks, a couple of whom were maimed and had been rescued. Mirissa also has a nice beach with gentle waves and an islet that can be reached at low tide and is a great place to watch the sunset or enjoy sweeping views of the beach. But the main reason for coming here is to see the whales, especially the largest creature on Earth, the Blue Whale. December to April is the peak season for whale watching. I set off early in the morning for my whale-watching trip. The trip took seven hours, but unfortunately I, and about 40 other folks, were left disappointed because we spotted no whales. We did, however, see spinner dolphins and a couple of turtles. 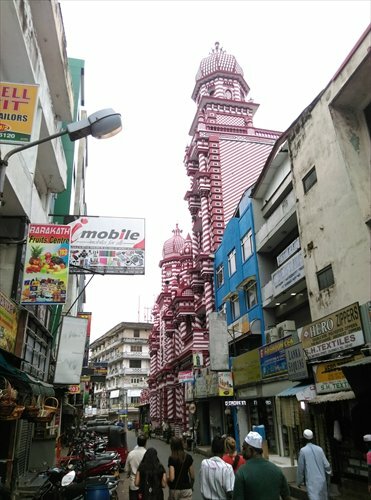 From the south, I made my way back up to Colombo and then to Kandy, the island's cultural capital. The Kandyan Kingdom existed as an independent entity until the early 19th century when it was finally annexed by the British. As such, the city harbors a sense of distinction reflected in its art. The most obvious way to enjoy this is to see a cultural show, which are nightly one-hour long performances featuring song, dance and drums divided up into multiple acts. Don't go expecting a Bollywood-like circus act because it is actually a rather dignified performance. In August, the city marks the Esala Perahera, a 10-day festival that honors the Buddha's tooth and is the country's most famous religious event. The city is surrounded entirely by hills - which explains why it survived so long - and is dominated by a lake at its center. It is man-made, created by the kingdom's last king, but it provides pleasant views and is home to an incredible amount of egrets, cormorants, ducks and kingfishers. While I gave the city's most famous attraction, the Temple of the Tooth, a pass because you cannot actually see the tooth, which is hidden away, I visited several outlying attractions. 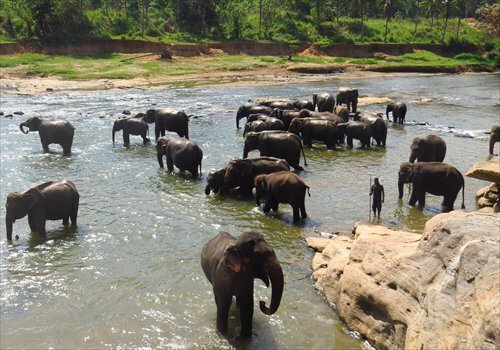 One was the elephant orphanage at Pinnawala 77 kilometers away, where over 80 elephants live in a large compound divided into open spaces. The elephants are fed and bathed at specific times during the day, the latter a marvelous sight as elephants are marched outside the compound and across the road towards the river to spend a couple of hours. Another site was the botanical gardens at Peradeniya. I'm usually not very enthused by trees and plants, but I have to admit this place was impressive. There are towering trees, palm avenues, a small suspension bridge on which people need to take turns to go on otherwise the whole thing could break and plunge into the river below, and nice greenhouses for orchids and other plants. At one of the latter a gardener showed me the plants and explained their qualities, but then asked for a tip at the end. I also took a day trip to Sigiriya, the country's most famous attraction next to Galle Fort, and Dambulla. 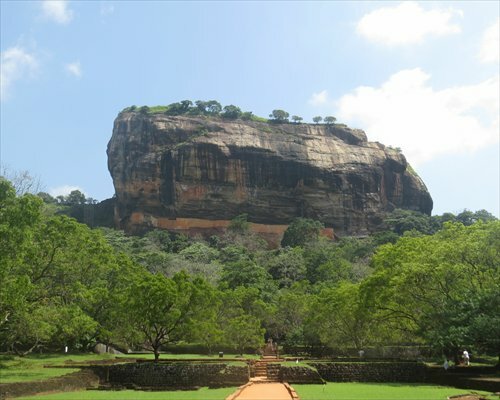 Sigiriya, or Lion Rock, is a massive outcrop topped with the ruins of a fortress or, as some argue, a monastery. Whatever it used to be, Sigiriya is an impressive sight that looms 200 meters over the surrounding plains. When you get to the top, passing by murals of extremely generously endowed women and gardens, you can climb around the ruins and take in the view of the surrounding dense forest, where herds of elephants live, that seems to stretch for miles. Dambulla, less impressive but with a history of over 2,000 years, is a series of Buddhist cave temples filled with statues and paintings on top of a hill. Taking the train to Kandy is also a nice way to preview the fantastic mountain views provided on the hill railway. Built by the British back in the 19th century and still working in 2016, the rail edges its way up and along the island's highlands, passing by and stopping at old train stations staffed by employees in immaculate white uniforms, another stark example of British influence. From Kandy, I took the train to Nuwara Eliya, the "capital" of hill country. As fine as the views were approaching Kandy, the scenery leaving the city was twice as grand. Pine forests, deep valleys, shimmering tea estates and mountain ranges filled the way to Nuwara Eliya. Nuwara Eliya is a small town nestled in a valley with the country's highest mountain Piduruthalagala in the background. The main reasons people come are to visit Horton Plains park one hour away and enjoy the surrounding tea estates and hikes. I had to reluctantly choose not to do the latter due to time and fitness constraints, but I did enjoy the former. Single Tree Hill is a moderate mountain on the edge of town that provides great views overlooking Nuwara Eliya, its little lake and racecourse, another vestige of British colonialism. On the hill are photogenic tea estates that resemble beautiful green carpets draped across the slopes. It's a view that's enhanced by tea laborers picking the leaves. Finally, I returned to the capital on a rickety overnight train. I was almost too tired to explore Colombo but I managed to take in the national museum, Buddhist and Hindu temples, mosques, colonial buildings and the Galle Face Green. The latter is a long stretch of land that fronts the sea, with a narrow beach in between. In the evening, it is a superb hive of activity as locals gather to watch the sunset, couples sit together, kids fly kites and travelers walk around taking in everything. Sri Lanka is a fine place to visit and if, like me, you've never been to South Asia before, it is a great introduction. It's not hard to see why it's sometimes referred to as the "pearl of the Indian Ocean."